Vision loss is common among seniors, and it is important to find stimulating activities that can prevent them from becoming frustrated. When seniors begin to lose their vision, keep in mind their other senses may still be strong. Stimulating the other senses is the key to finding fun things for your loved one to do. If your loved one is experiencing vision loss and has trouble accomplishing daily tasks, consider hiring a professional caregiver. Rhode Island elderly care experts are available to provide high-quality care to seniors on an as-needed basis. From assistance with mobility and exercise to providing transportation to the doctor’s office and social events, there are a variety of ways professional caregivers can help your aging loved one continue to live independently. These 5 activities are entertaining and can be easily accomplished by seniors with poor vision. With a few modifications to ensure their comfort, seniors with vision loss can continue to enjoy swimming laps or taking a water aerobics class. While your loved one is swimming laps, count how many strokes it takes for him or her to get to the end of the lane so he or she knows when to turn. Water aerobics are easier for seniors who can’t see if there is an instructor to verbally describe each exercise. Stroking a pet’s soft fur is a sensory experience that does not require vision. When adopting a new animal, help your loved one get comfortable with the new pet. With some assistance, your loved one can take the animal for a walk, brush its fur, and play simple games such as fetch. Spending time with animals is a great way to boost a senior’s mental wellbeing while also providing benefits for the heart. Learning is a lifelong pursuit that helps keep the mind sharp. Explore local educational events in your area that your loved one can attend. Colleges, museums, and other community programs often hold educational lectures that are open to the public. Attending such an event can give your loved one some new things to think about and a few fun topics for conversations. Seniors with vision loss sometimes give up cooking because they have difficulty reading measurements and fine print. Help revive your loved one’s joy for the culinary arts with some minor adaptations. For example, you can find measuring cups with color-coded markings so your loved one can measure quantities easily. You can also prepare beforehand by chopping ingredients so your loved one simply has to mix them to make the recipe. However, you may not always be available to help your loved one follow or cook a recipe. If you are the primary caregiver for a senior loved one in Rhode Island, respite home care is available when you need time away from your important caregiving duties. At Home Care Assistance, our respite caregivers are available 24 hours a day, 7 days a week to help your loved one manage everyday tasks in the comfort of home while you have the chance to take a much-needed break. Pull out some art supplies and encourage your loved one to sculpt, paint, or create a crocheted blanket. 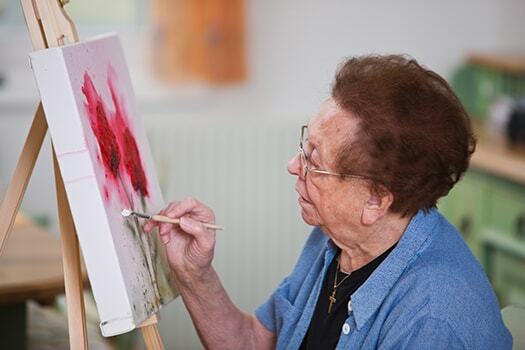 Since most art activities rely on touch more than vision, your loved one can experiment with different mediums until he or she finds a favorite one. Whether your loved one makes a clay vase to give as a gift or knits hats for the homeless, he or she will enjoy using his or her creative skills to bring happiness to others. While these activities are beneficial for seniors with vision loss, they can also provide benefits for those who have serious dementia-related medical conditions such as Alzheimer’s. If your loved one has Alzheimer’s, consider hiring a trained caregiver. For reliable Alzheimer’s home care, Rhode Island families can turn to Home Care Assistance. We are a leading provider of professional memory care designed to help seniors maintain a higher quality of life. In addition to Alzheimer’s care, we also provide comprehensive dementia, Parkinson’s, and stroke care. From revolutionary care programs to compassionate and dedicated caregivers, we can meet all of your Alzheimer’s home care needs. For more information on our in-home care services, please call one of our knowledgeable Care Managers today at (401) 284-0979.